Grade Potential gives your first grader a strong foundation for a lifetime of learning. 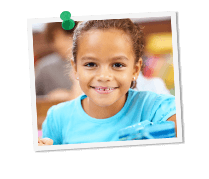 Through personalized, one-on-one first grade tutoring, we help your child master new subjects and reach academic goals. In the process, we build your child’s confidence in learning environments, too. Each 1st grade tutor at Grade Potential is committed to providing personalized support for the first graders we serve. We cater to each child’s unique personality and learning style in order to maximize learning opportunities. From the first phone call you make to our office, you will notice that we want to understand your child in order to most effectively help him or her. Children are always developing—and that’s why the right kind of support is so important. Unless otherwise requested, Grade Potential provides first grade tutoring from credential teachers who are both skilled at working with young children and passionate about teaching. What’s more, we take great care to make sure that the tutor you work with is well suited to your specific child.